Day in and day out, week after week, you go to the gym banging out the same workout routine. If you’ve been following my advice and routines you probably are seeing gains but maybe you want to switch it up a bit. No matter what your goals are in the gym, this 3 day power and pump routine should do your body good. The idea behind this routine was from a dedicated reader who also wrote a great recipe for us. This routine is meant to be run for at least 8 weeks. 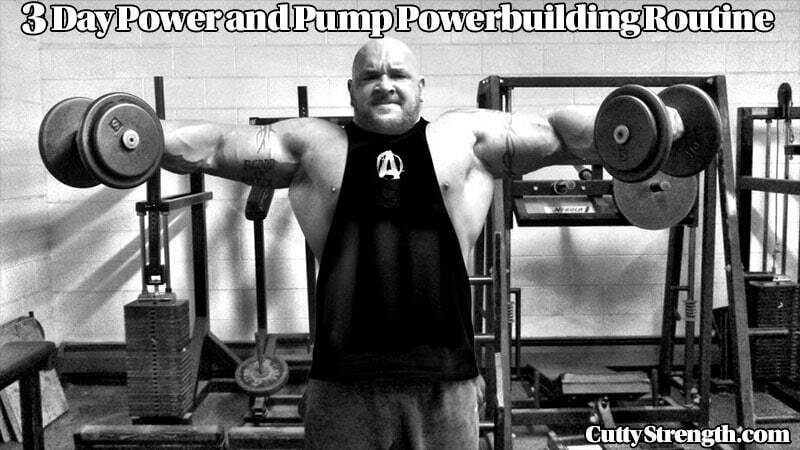 The goal of this workout is to increase strength and get a good pump. This routine is intended to be a good break from heavy lifting but will have great carry-over with strength and muscle gains. You will be completing a few big compound lifts at a sub-maximal weight (think speed work) and then getting your pump on with isolation and machine work. I would recommend going on a slow bulk for this routine to get the most out of it. It is easier to cut some fat afterwards than trying to make strength gains on a calorie deficit. These all add flavor and healthy fats to your diet. Personally, I prefer adding calories through this means instead of going to McDonalds and smashing a few McDoubles. You will feel better, have more energy, and your stomach will thank you. Note: A little bit goes a long way, so be sure to know how many calories you are adding. I always recommend food over supplementation because you will feel better overall eating a wide variety of whole foods than you will simply living off of supplements. With that being said, this routine is designed to help your body recover from heavy sessions and any strains or pains you may have picked up along the way. MTS Nutrition Machine Fuel – The innovative MTS Nutrition is forging the way with great tasting (from personal experience) amazing products that are seriously making huge waves in the supplement industry. Machine Fuel is a great tasting intra-workout BCAA that you should check out. BCAAs are muscle sparing and are great when you are an endurance athlete. Fish Oil – This is a tried and true supplement that will help with joint health, anti-inflammatory, and just an overall great supplement. This small investment can make a huge difference in how you feel on a daily basis. I highly recommend checking out the other benefits to fish oil. Optimum Nutrition Micronized Creatine – One of THE most tested supplements, creatine helps with recovery and athletic performance. Many pre-workouts have creatine in them, but I recommend having another 5g daily. It is one of the cheapest supplements and the most effective. Bio-Gro – While I haven’t used Bio Gro, I have many friends and acquaintances who do use it and tell me how much they like it. I will work on getting some and giving you an honest opinion at some point. Do some homework and try it out if it sounds good. ZMA – I currently have ZMA on the way and I am excited. ZMA helps with getting a deeper sleep (think recovery) and is one of the ingredients in my beloved Bullet Proof from Muscle Pharm that was discontinued. MTS Machine Whey Protein: 5lbs – Last but not least, protein. This stuff is golden. This routine will be paired with some HIIT/power type cardio which will be a great addition to your power work you’ll be doing. Conditioning is important to overall health and will affect your strength and power production… don’t skip out. I recommend 2 days outside of the gym to do HIIT training. You do not have to go to the gym for this, in fact I recommend not going. I recommend 15-20 minutes of HIIT training on off days. This section is only applicable to the big compound lifts; the isolation movements will be your usual weights. Depending what your rep scheme is, this will be a little different but I will break it down for you.. this isn’t meant to be scientific. This is supposed to feel light and not taxing on the nervous system. Generate as much speed and force with these reps. Think of this as speed work and form work. If you have any small form adjustments to test out, now is the time. The progression scheme with this routine is simple: add weight or reps each week. The goal here is to keep all of the compound lifts far away from grinders. You should not grind any rep even if your form is off and you feel sick on this routine. Don’t let your ego get the best of you on these compound lifts. You’re going to be amazed at your strength gains from this routine. Leave any comments or questions below! Hi, Cutty. Pardon my ingnorance but. What,s a GRINDER? at the Gym off cousre. A grinder is a rep that’s really hard but you end up getting it.. It’s one you have to really fight for to pull off the rep.
Hello Cutty. In this section you say something about warm up series. It means that i should do one set x 8 or ten reps with 65 to 70% before my working set? Lets supose i,m doing heavy liftings in 4 X 8 reps with 110kg. ( 242 pounds). 1×10 bar, 1×8 135, 1×8 185, 1×5 225, 1×1 235, then 242.. it some need more others don’t need as much but the point of warming up is to get your body warmed up and your nervous system primed to lift heavy weight.